The CFValve™ provides consistently accurate (±1.5%) flow rates for metering and mixing fluids (liquids and gas). The CFValve™ can replace expensive electronic equipment, while concurrently reducing water and ingredient waste. It also eliminates pressure and flow drop in applications with multiple outputs. In an application with a varying number of output, the CFValve™ ensures that flow rate is constant regardless of the number of outlets. The Gate CFValve™, used in conjunction with Gate's Modular Mix on Demand™ (MMOD™)Systems, provide accurate, on-demand metering and mixing for factory floor and mobile applications. Gate provides standard and customizable industrial solutions that can be used for factory floor mixing on-demand from water only tanks or using a city water source. Additional Gate solutions allow mixing on-demand from concentrate at commercial sites. 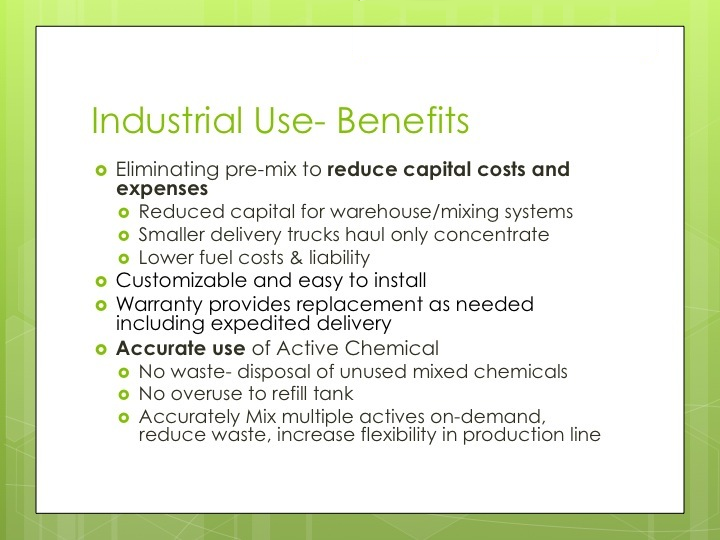 Mixing concentrate on-demand, reduces the need for batch processing, large tanks/warehouses, cleaning and disposal of unused mixed product, leading to exponential savings in both time and money. Furthermore, mixing from water only tanks provides flexibility, allowing operators to vary mixes of multiple ingredients on demand, and to also change formulations during the same run without having to empty or clean tanks.